We know that comprehensive pain treatment gives patients the best results. Less pain and better functioning. Unfortunately there are few integrative pain centers available, and few doctors practice truly bio-psycho-social care on their own. 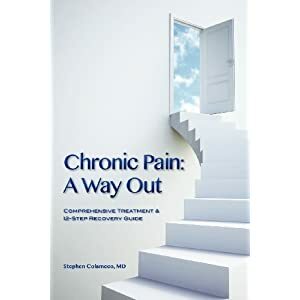 Dr. Stephen Colameco’s book Chronic Pain: A Way Out, is a wonderful example of a complete pain care program. As he is an addiction specialist, Dr. Colameco’s section on opiates and addiction is excellent. The approach Colameco presents is spiritually based, and this will appeal to some and not to others. Overall this book is very strong. It is one of the few patient-oriented books that describes a truly comprehensive treatment program. The sections on psychological skills and an attitude of acceptance are particularly helpful, especially given the book isn’t written by a mental health practitioner. It would be appropriate for those who would welcome a spiritual approach. It can offer a way out of suffering and a way back into your life.